Dilmurod Sayid served nine years of a twelve and a half year sentence in one of the harshest penal colonies in Uzbelistan before his release in February 2018. His wife and six year old daughter died in a car crash whilst travelling to visit him in prison in 2009. 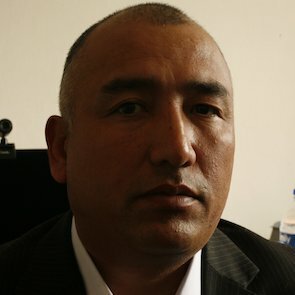 Dilmurod suffers from tuberculosis as a result of his stay in prison. It is truly humbling and inspiring to meet him, see that the spirit still burns brightly, and that he is determined to continue his work for human rights. Andrew Anderson meeting with Dilmurod Sayid. I met with Dilmurod in his apartment in Tashkent together with Akzam Turgunov, who also spent nine years in prison for his human rights work. They point out that, although a number of human rights defenders have been released from prison since Shavkat Mirziyoyev became President in December 2016, many people remain unjustly imprisoned in poor conditions. They have decided to try and set up a new organization to work for the rights of prisoners and have submitted registration documents. Akzam Turgunov showing documents to Andrew Anderson. 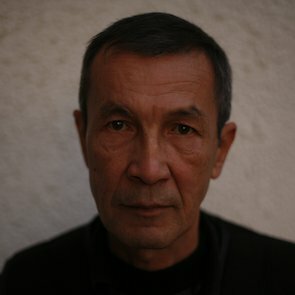 Many human rights defenders recognise that apart from their release the changes so far in Uzbekistan have been largely cosmetic. The man at the top has changed, but the same people are in power, and the judiciary is under political control. They know that they risk returning to jail in a new clampdown, they point out where the security agents park when they regularly demonstrate that they are still under surveillance, but yet they persist in their peaceful work for human rights and seek to involve a new generation in the struggle. Earlier we had met with Azam Farmonov in Djizak who was released in 2017 after serving eleven and a half years of his sentence. He is also involved in the initiative with Dilmurod and Akzam as he explained over lunch of traditional Uzbek samsa, the steamed lamb dumplings he insisted were best in Djizak. All the human rights defenders we met with were seeking to make advances in the more liberal climate that has followed President Mirziyoyev coming to power. We met with women human rights defenders who were cautiously optimistic about a bill currently in the parliament that would criminalise domestic violence. Some are working also to provide support for victims through refuges and others are seeking to promote more awareness and empowerment. Some were cautiously optimistic, but all recognised that the risk of a return to repression remained. It was a particular pleasure to meet with Ahmadjan Madmarov at his home in Margilan in the Fergana valley. 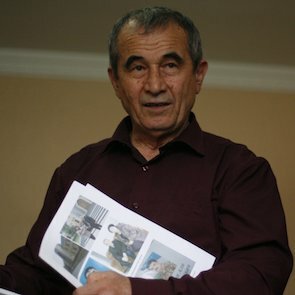 Ahmadjan has been supporting the families of prisoners, writing letters appealing for visiting rights, accompanying family members travelling for prison visits, throughout the brutal Karimov regime. Three of his sons were imprisoned and two of his nephews. He was told they would be released if he stopped his human rights work. He visited his sons in prison and they said he should continue, who else would help the prisoner’s families they said. 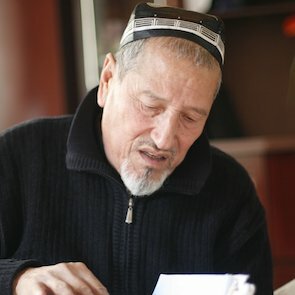 Ahmadjan believes that if he had not received the 2006 Front Line Defenders Award he would have been imprisoned as well. As he served us tea and home-grown apricots he said that it was only that international recognition which had enabled him to continue. Two of his sons and one nephew have now been released, his eldest son Abdullah was released in April 2018 after 19 years in prison, but he explained how the prison authorities had fabricated an excuse to keep his other son in prison on an extended sentence. Ahmadjon Madmarov holding picture of him with the FLD Award from 2006. The absence of any independent judicial review of such arbitrary abuses of power is a reminder of how fragile the current situation is for human rights defenders in Uzbekistan. And yet their integrity, humanity and determination gives hope for a better future.